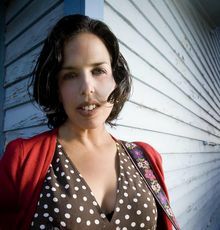 "Melissa Greener is one of those rare artists who appear on the scene with all their talents maturely developed. Blessed with a glorious, outsized, and utterly distinctive voice, Greener is an accomplished guitarist and an arresting songwriter. The music is strikingly original and impressively varied, featuring strong, catchy melodies in strange and brooding voicings. Melissa Greener is a pro." "Be awake and alert, expend the time, and you’ll grasp the Technicolor grandeur contained within Greener’s DWELLING. Via tightly edited lyrics Greener succeeds in painting superb portraits of the human condition – hers and ours." "Melissa could warm up the North Pole with her songs... OUTSTANDING!" "I knew, listening to Melissa, that I was standing in the presence of greatness."